'He's a sorry sight' said my friend, the kitten-rescuer. 'Are you sure you want him?' A second kitten, cute, fluffy and ginger, rubbed in my legs and squeaked appealingly. 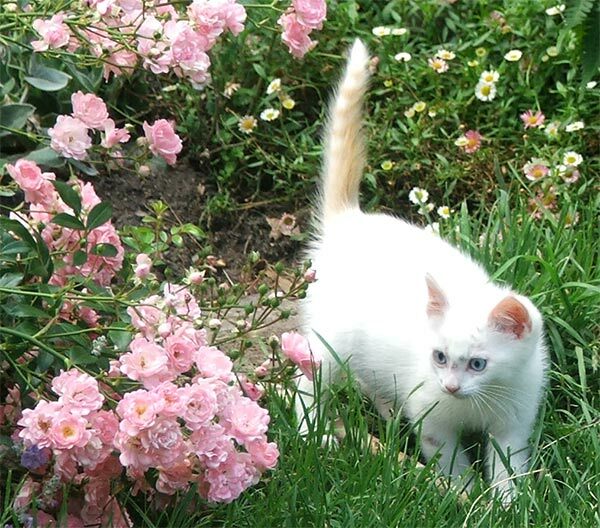 White kitten was wary, and stood back. But I knew I would be bringing him home - he was simply too sad and ugly to leave behind. Oops. I brought the second kitten home as well. They would be house brothers, and I'd spend lots of time with the white scaredy-cat, to get him used to being handled. Love would win him over. And so Beige-Puss came to live at Mooseys. Is Anyone Strange Out There? One year later and Beige-Puss has been rechristened B-Puss. And guess what the 'B' in his name now stands for? 'B' stands for Beautiful! 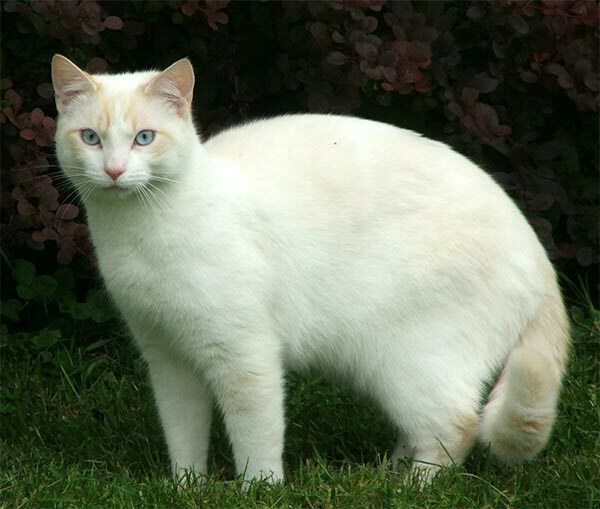 He has grown into the most beautiful white cat, with the lightest of caramel shading on his face and shoulders, and delicate caramel stripes on his tail. B-Puss has pale blue eyes, and he 'talks' with them - they're narrow and smiling when he's relaxed. But when he's on high alert those blue eyes are huge and staring. And dear B-Puss is often in a state of extreme alert, code red! 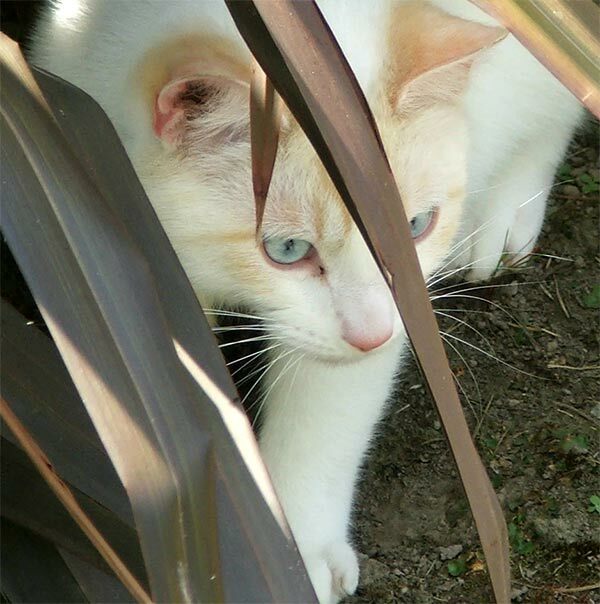 B-Puss, my Blue-Eyed, Brave, Bold and Beautiful Boy-Cat, I love you to bits! 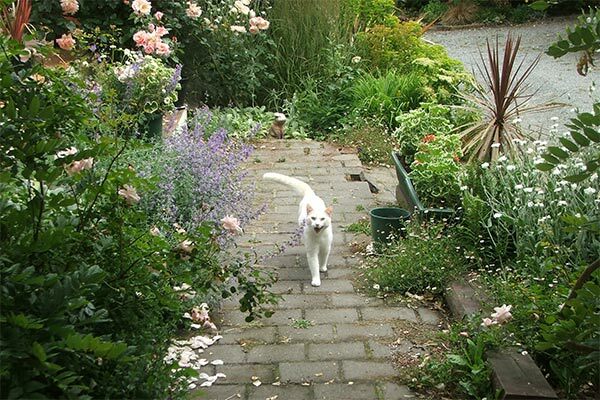 I'm sad to say that B-Puss didn't live the long country garden life I had planned for him. When still a young adult he succumbed to lung cancer. 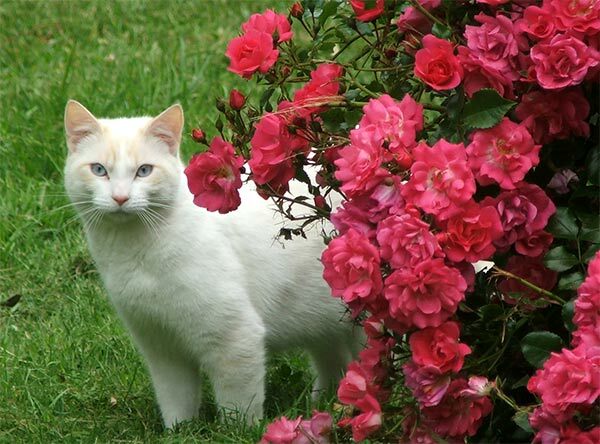 I can still 'see' him peeping around the roses. Dear B-Puss - we will never, ever forget you!